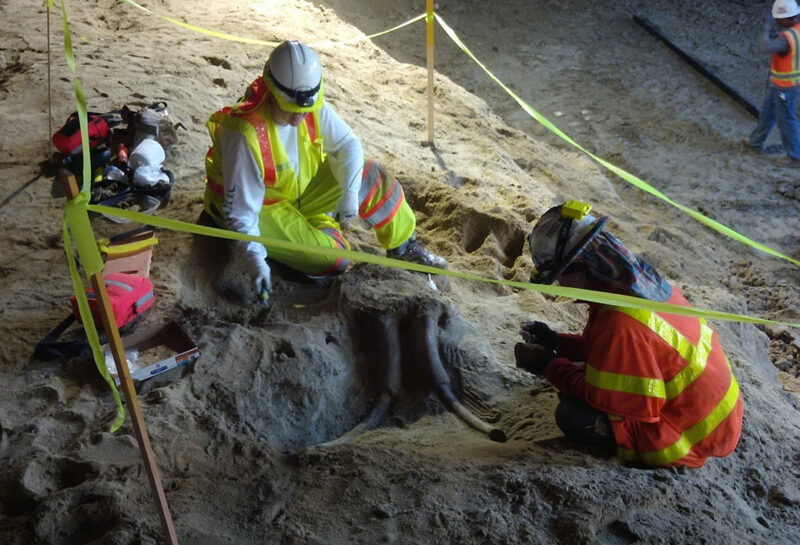 Last week, construction workers unearthed the remains of a woolly giant while expanding Los Angeles’ (California) Purple [Metro] Line. They took great care and stopped construction so that paleontologists could assess the fossils, jacket them, and remove them to the safety of a lab. The fossils will end up at the Natural History Museum of LA County. But what did they find? The workers found a three-foot section of tusk and mastodon tooth fragments. When the paleontologists started working, they found a partial skull with tusks of a younger individual. These parts belonged to either a mammoth or a mastodon. Dr. Ashley Leger (left) and Bethany Ader (right) excavating the fossil. From LA Metro. You might be wondering what the difference is between a mammoth and a mastodon. After all, they’re both large, extinct elephants. A mammoth has teeth that are intended for consuming grass. Grass has little beads of sand (silica) embedded in its fibers, so eating it requires teeth that can grind down the fiber. Silica is very tough and can wear down teeth, so animals that eat grass have to have very tall teeth (called high crowned) so that as the tooth wears down, more tooth is available for chewing. Mastodons ate mostly leaves, fruits, and other plant material, but no grass. Their teeth could be shorter (called low crowned) and had larger bumps (cusps) to break up the plants. 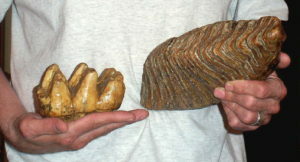 A mastodon tooth on the left and a mammoth tooth on the right. Photo from Bluff Country Fossils. Both mammoths and mastodons are found in many places in North America because during the last ice age (around 24,000 years ago) the climate and habitat in North America was much cooler and drier than it is today. They started to go extinct as the climate warmed up, though their exact cause is unknown. One population of mammoths did survive much longer than the others, on an Alaskan island – you can read more about them [here]. For now, the fossils are safe. As workers find more fossils, we may understand more about this population of extinct elephants. This entry was posted in English and tagged Los Ángeles, Mammoth, Mastodon, Metro. Bookmark the permalink.